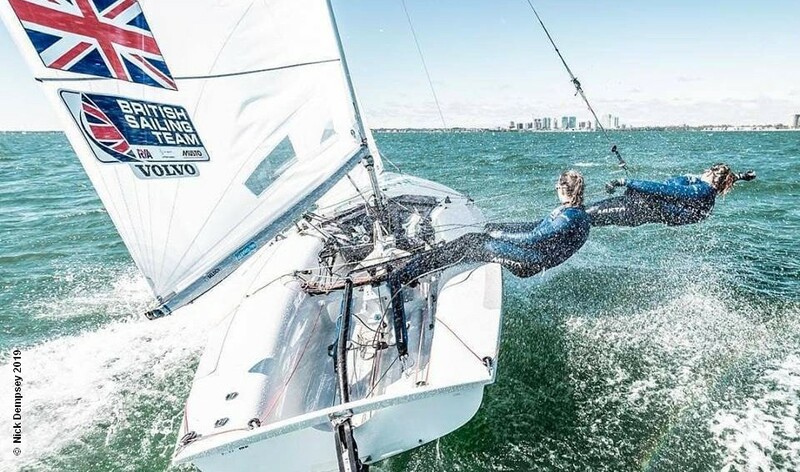 Day 1 of the Mallorca Sailing Centre Olympic Classes Regatta that has attracted a lot of top international sailors preparing for the Princesa Sofia event at the end of the month. For most that regatta will be the start of the first stage of the selection process for Tokyo 2020, with the test event in August the target for the Brits. The Mallorca Sailing Centre Regatta races are an important home event for the Spanish, and this year for many other competitors from around the world, none more so than the British Sailing Team members. Straight out of the box we have Amy Seabright and Anna Carpenter (3,5,6) in second place of the 470, ahead of GbR team rivals Hannah Mills and Eilidh McIntyre (6,1,10) in fourth. The German pair Luise and Helena Wanser (2,2,2) lead. In the highly competitive men’s 49er, Dylan Fletcher and Stuart Bithell (5,4,4) are tied for the lead with Sime and Mihovil Fantela (2,9,2), their recent SailGP Multihull efforts not slowing them down. British Team rivals James Peters and Fynn Sterritt (3,8,6) are just four points back. The Norwegian pair Tomas and Mads Mathisen were the stand out team with two race wins, are in sixth place . Really hitting their stride are Ben Saxton and Nikki Boniface (1,2,1) with a whopping ten point lead over Marie Soler and Hugues Puimatto (2,9,3) of France. Chris Rashley and Laura Giovannetti (3,5,9) are in fourth, John Gimson and Anna Burnet (8,1,16) are sixth. Sophie Weguelin and Sophie Ainsworth (4,9,13) are in fifth place in the women’s 49erFX, with Charlotte Dobson and Saskia Tidey (9,1,19) three points back in ninth place. Leaders are Sweden’s Klara Wester and Rebecca Netzler with a very useful 1, 7, 1 scoreline. On the boards, Emma Wilson (4,2,3) is second to the flying Charline Picon of France with a hat-trick of wins. While in the men’s event Angel Granda (2,6,1) of Spain leads from Shahar Zubari (12,1,3) of Israel. Dan Wilson (4,13,9) is best Brit in ninth place. After that it goes a bit soft for GBR, with Luke Patiance and Chris Grube (8,12,5) seventh in the men’s 470, where Pavel Sozykin and Denis Grianov (2,1,7) of Russia lead. In the Radial event Maria Erdi (6,1,2) of Hungary has a four point lead over Paige Railey (10,2,1). Hannah Snellgrove is best Brit in 16th. Giovanni Coccluto (4,4,5) of Italy leads the men’s Laser ahead of Kuba Rodzyn (11,1,3). While in the Finn, Zsombor Berecz (1,2) of Hungary leads by four points from Nils Theunick (6,1) of Switzerland. No GBR competitors in either of those events. The event continues to Sunday.